We felines might be full of curiosity but when it comes to home territory, we generally like to stick with what we know. And we certainly don’t care for travel! 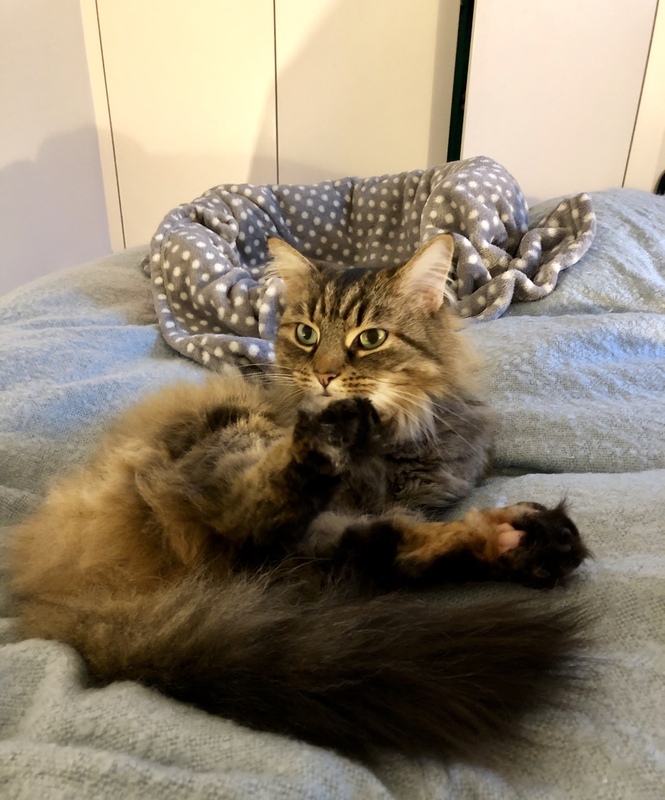 So when Mr Monty’s Fuss and Feed clients, Clarie and Ed, were offered the chance to move to Portugal for a year, the most important factor in their decision was their beloved feline friend – Millie Miller. They knew they could never leave her behind, but what would be the least stressful way to get her to Lisbon? Here Claire shares their story – the research, the decisions, and the actual journey, with some tips along the way. And even if you are travelling in this country with your feline companion, we hope you find it helpful. It’s Thursday the 27th of December 2018. It’s 5am and my alarm has just gone off. I’ve been dreading this day ever since my husband Ed and I decided to relocate to Lisbon a few months ago, and after the initial excitement of moving abroad had worn off. After weeks of preparation, several sleepless nights, and endless worrying whether we’d made the right decision, it was finally move day and there was no going back. We’d rented out our home in London (the tenant was moving into it in a week’s time!) we’d signed a year-long lease in Lisbon, and all our belongings were already somewhere in Europe en route with an international removals company. But our big move abroad was made all the more stressful because of one very loved, long haired tabby who goes by the name of Millie Miller. Millie is now four and a half years old but ever since we adopted her as a tiny, fluffy kitten at 11 weeks, she has always been a slightly anxious cat, particularly when it comes to meeting new people. When it’s just me and Ed at home she’s the happiest cat and the ultimate queen bee. She rules the roost with so much sass and swag she could give Miss Mariah Carey a run for her money. However as soon as there’s a knock at the door or someone enters from ‘the scary front’ she bolts out the back door without even waiting to see who it is that dares cross into her hood. When Ed first broached the idea of us moving to Lisbon, because he’d be spending a lot more time out there with work, my initial thought was absolutely no way! I mean honestly, why would we ever consider such upheaval when we were so happy and settled at home in London? We have our gorgeous house, we have incredible friends and family close by, and we both have great careers here. I’m a freelancer working in TV production, mainly on awards shows and events, so I can really only ever work in London. 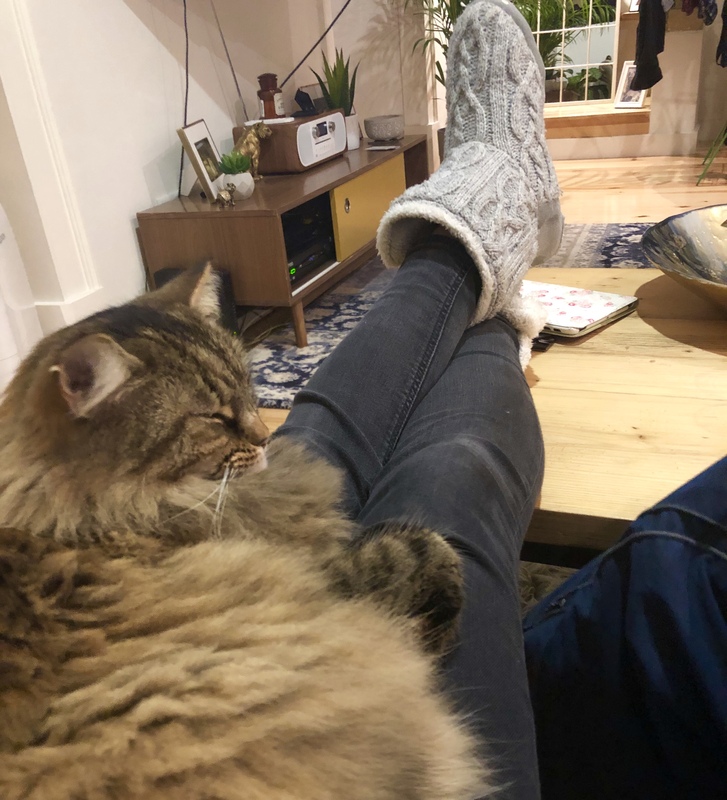 But my main reason was that there was no way on earth we could ever move Millie – even a trip to the vets was traumatic enough. After a few weeks the idea of living abroad really started to appeal to me more and more. I started to get quite excited at the prospect of better weather, a permanent suntan, and living that European lifestyle we Londoners are always so envious of. On top of this, South West Trains seemed to be getting worse, the Tube more unbearable by the day, and everyone in London just seemed miserable most the time. And of course it would mean seeing a lot more of Ed who has been visiting Lisbon for work once or twice every month for the last two years. His company was now in the process of purchasing of a new site in the city centre meaning he was about to spend a lot more time out there. Furthermore the company was willing to help us relocate, so moving abroad for a year or so became too good an opportunity for us to miss. I finally came around and the preparations began. It was time to concentrate full time on the logistics of moving from London to Lisbon. The ‘To Do’ list was endless (even more than for our wedding!) and at times it was too overwhelming even for someone as organised as me. Much of this stress was focused on Millie because moving her 1,400 miles was never going to be easy. 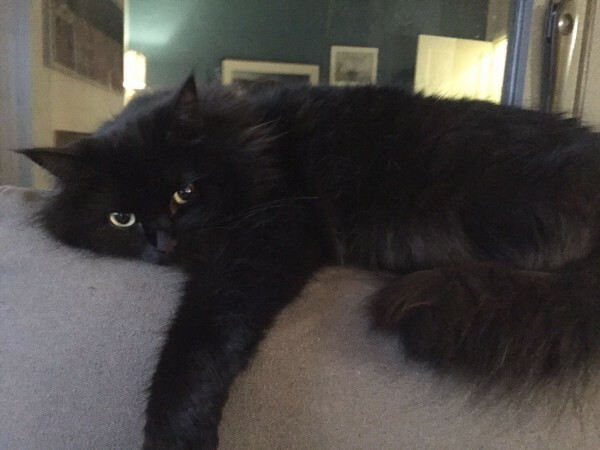 We did think about leaving her with someone in the UK but we knew we would constantly worry that she’d be miserable without us because she already hates most other people. Mainly though, she’s such a huge part of our life that it wasn’t really an option. However I was convinced hat getting her to Lisbon was going to be nothing short of horrendous. Soon after we’d made our decision, Ed told me that the Portuguese airline, TAP, allows cats onboard their aircrafts – IN THE CABIN. I’d never heard of this before and to begin with this was a huge relief. I loved the idea she could be with us the entire step of the way so problem solved. Or so I initially thought. When I then started looking further into flying with her the reality set in and it was was far from ideal. Firstly, the airline has incredibly tight restrictions on the measurements of the cat carrier allowed in the cabin. It had to fit UNDER the seats in front and as a result could be no bigger than 40cm long, 33cm wide and 17cm high. 17cm high??? This didn’t sound like much at all and my concerns were confirmed once actually measured with a ruler it from the floor. I then spent weeks researching online but I still couldn’t find a cat carrier that actually met those measurements. 20cm in height was the smallest I could find. I decided to order a few different carriers to check them out. 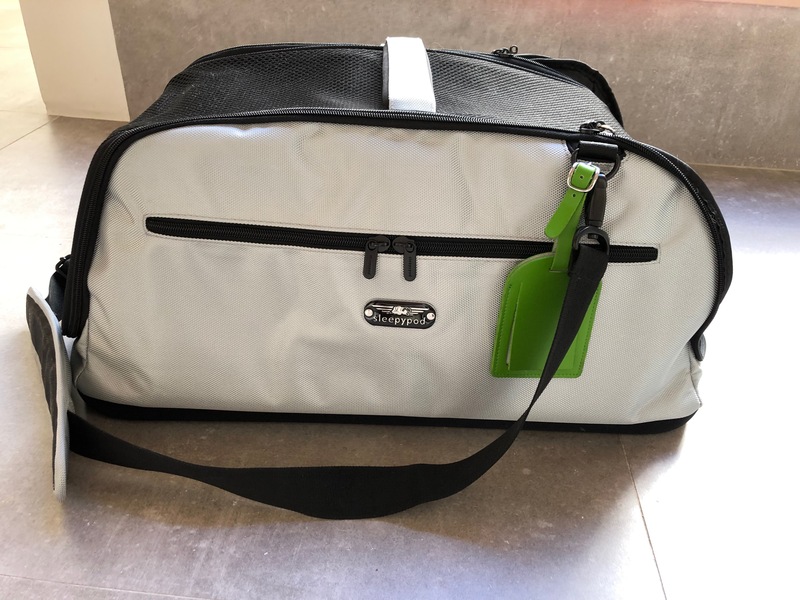 One arrived which did meet the airline’s measurements however it was so small I couldn’t face the thought of putting her in it for one minute let alone six hours. Another one was slightly bigger and came with a rather handy extra pull out area, so after take-off and landing, we could open it up giving Millie more room to move around. But on further examination the only way to extend this section was from the inside, meaning we’d have to open the bag up mid-flight. This didn’t seem a great idea at all. What if she made a run for it and got lost in one of those giant, metal, scary cabinets the cabin crew pull out and which seem to house an entire block of studio apartments? The search continued. A few days later I came across the Sleepypod Air (www.sleepypod.com) It seemed to tick all the boxes because although it was a decent size, the top and the sides of the carrier could be squashed down to fit within the airline’s measurement restriction. It was also approved by multiple airlines and had excellent reviews. The only down side was the price. At £149 it was a lot more expensive than other carriers. However we knew this was a crucial part of our move so we went ahead and ordered it. When it arrived I was pleasantly surprised by all its nifty features. Our decision was confirmed when Millie didn’t seem the slightest bit bothered by it and even started scenting it. Bingo – she approved! From that point on I left the Sleepypod out in our bedroom every day and started leaving treats it in it to encourage her to explore the carrier on her own. After a few days I would encourage her to go inside it by tempting her with more treats and heavy praise. Within a few days she was running up to it herself whenever I said the word ‘treat’ or rattled the packet of goodies. This was much easier than I’d imagined. After a week or so I decided it would be a good idea for her to start getting used to the noise of the zip. So, whenever she was inside I would zip it up a little bit at a time. The first time I did it I thought she would make a run for it and never get back inside again. She was obviously enjoying her treats too much to even notice the new sound but another great feature of the Sleepypod is that it helps reduce noise when the animal is inside. I continued doing this every day, zipping the carrier up a little more each time until I was fastening it all the way while she was inside still munching away. By this point she was completely nonplussed about the experience and just lapped up all the praise and attention when I let her out. It even started to be fun and I’m so pleased I took the time to do this as I think it really helped us in the long run. After another week or so later I decided to start picking her up in the Sleepypod while she was inside it and moving her to another room. At first she was a little wide eyed when she came out but after a while it was just another game and the treats were totally worth it. I then started carrying her all the way downstairs but again by this point I think she felt quite safe and it wasn’t a big deal. With her training complete, I felt satisfied she was as familiar with the carrier as she possibly could be. However as the day of our move approached, the idea of flying with her was becoming more of a nightmare. I was really starting to dread the thought of her being in the Sleepypod for six or seven hours. That was of course without any delays. And who knows what might happen on the day. Ten days before our official move date we flew out to Lisbon to collect the keys to our new apartment. I took the opportunity to do a little ‘dress-rehearsal’ of the journey, particularly at Heathrow airport. I made mental notes of each step of the way – from the moment we left our house, to the taxi ride, to checking in. My first real question about flying with Millie was airport security and what happens when passengers bring a cat through. I’d read several stories and blogs from people in America who had been made to take their cat out of the carrier and walk through the screeners with the cat in their arms. This would never, EVER, happen with Millie in a million years. When she doesn’t want to be carried it’s impossible to keep hold of her. And even if I did manage to hold on and get through the first hurdle of walking us both through security, no amount of treats in the world would persuade her to get her back in the Sleepypod. She would be terrified, and that was before we even got on the plane. It turned out I wouldn’t have to do this at Heathrow Airport (Terminal 2). She would still need to come out of the carrier long enough for them to scan it but this would happen in a closed room just to the side of the security lanes. Although this would be much better, it still wasn’t ideal. What if we couldn’t get her back in her carrier? As we then walked through the airport I really listened to everything with fresh ears. When you really listen and I mean really, really listen, airports are incredibly noisy. We found it impossible to find a quiet area where we could potentially sit with Millie. There were always crying kids or loud groups of teenagers joking around nearby. There was no denying this place would be Millie’s worst nightmare. But it was during the plane journey that all my fears about flying her were confirmed. I thought the airport was noisy but nothing compared to the din the aircraft makes during take off and landing. Once you actually close your eyes and concentrate on every sound, it’s really quite frightening. I hate flying at the best of times and as soon as there’s any turbulence my heart races and my hands get sweaty. What if that happened? If I was frightened, imagine how Millie would feel? And what about her tiny little ears? I had a cold and was really bunged up at the time so I found take off and landing quite painful. Cats have really small ears so how do they cope with the pressure? I also saw what the change in pressure did to my half full water bottle after we landed. Now I’m not comparing Millie to a crumpled up plastic bottle of Evian but it just confirmed my mounting unease about flying her. I was really starting to panic. On our return to London I started getting advice from other people about travelling with cats and it’s here I’d especially like to say a really big thank you to Elaine & Graham at Mr Monty’s Fuss & Feed for their time and advice. 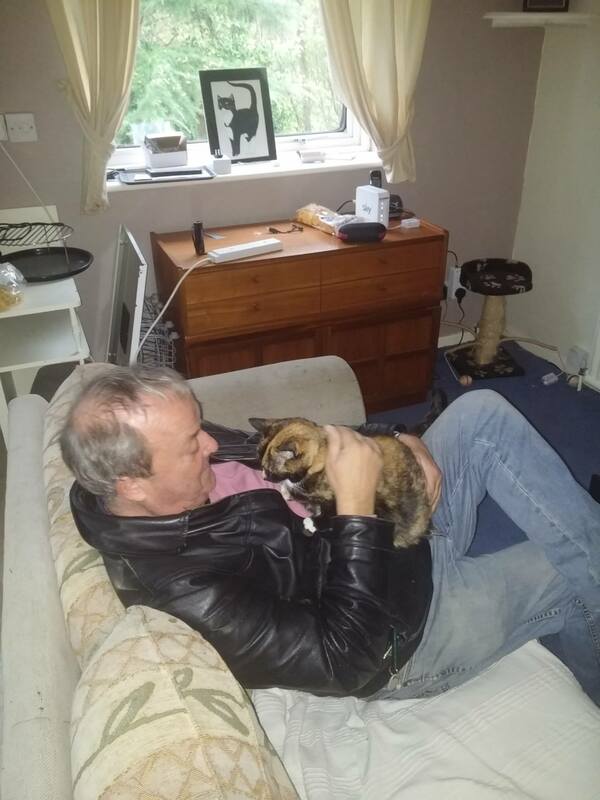 Not only do they know Millie well, having looked after her for four years whenever we’ve gone away, they’re also a wonderful source of cat knowledge and wisdom, and were ever so helpful. The more I talked through the pros and cons of flying Millie versus driving, the latter became increasingly much more appealing. Then ‘drone-gate’ happened, shutting down Gatwick airport. It was yet more proof of how little control you have when flying. Some people were stuck on Easyjet planes on runways for seven hours. What we would have done with Millie onboard, stuck in her carrier for that length of time? Finally, I suggested we should toss a coin. But we didn’t actually get to toss it. While I was getting the coin I announced, “if it lands on flying, I’ll want to toss again”. So that was it. Decision made: we were driving. And we only had a week to prepare. We had to collect Ed’s parents’ car, which is much bigger than ours, and we also needed to find a pet friendly hotel for our stop-over in France. That proved easier than I’d imagined but I wish I’d done a bit more research before booking the first one I found – more about that later. Then of course we had Christmas to deal with and endless family appearances so it was a busy time to say the least. Millie’s ‘training’ in the Sleepypod continued, although by now she knew something was up. Removal men had been in and out of the house, which she hated. Most of our furniture was now missing, there were suitcases and boxes everywhere, and we noticed a definite change in her behaviour. She stopped taking her time munching on her treats when inside the carrier. Instead she gobbled them quickly before dashing back out. Unsurprisingly she was a lot more nervous and unsettled. A few days before our big road trip we decided to take her in the car with us while we collected our Thai takeaway from around the corner. She meowed for the first couple of minutes but that was it. We went straight back home, Green Curry and Pad Thai in hand, and within seconds of coming out of the Sleepypod she was back to normal, enjoying her dinner followed by her favourite: cat milk. Later that night I put more treats back in the Sleepypod hoping she’d still go in and to my amazement she did. This made me feel so much better. We were now only four days away from our road trip and I knew we’d made the right decision. The alarm went off at 5am on December 27th and Millie was super excited because it meant an early breakfast. One of the first things we did after making our decision to move aboard, was call our vet – The Cat Doctor. 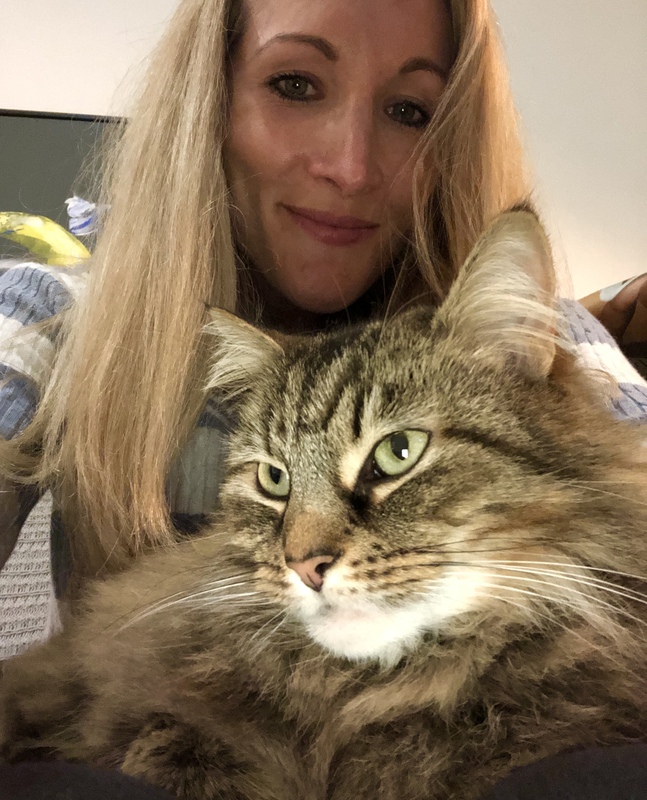 As well as giving us lots of valuable information, including how to get a Pet Passport, she had prescribed Gabapentin pills to help keep Millie calm. I’d already done a trial by giving her two pills one day when I knew I didn’t have to go out, and I’d seen how chilled they made her. I put two pills in her breakfast, knowing they take an hour to kick in. That was perfect as we were hitting the road at 6am. Everything was packed, including Millie’s Pet Passport. Although each European country has their own legal requirements for taking a pet abroad there are some commonalities. Your cat must be micro-chipped, all their annual vaccinations need to be up to date, and they MUST have a Rabies jab. This needs to be done a minimum of 21 days before travelling which is how long the vaccine takes to be fully effective. Also, most countries require a certificate of health from a vet confirming the animal is fit enough to travel. The whole Pet Passport process was definitely one of the more simple aspects of our move abroad, and cost around £160 in total. So at 6am, the car fully packed, it was nearly time for us to leave. Millie is quite good at going to the toilet if one of us goes outside. She’s a creature of habit and tends to go first thing, so I took a little walk in the garden in hope she’d follow. Sure enough, a couple of minutes later, she followed me out, dug a hole in the flower bed and relieved herself, to MY relief! I’d been worried about Millie having an accident at the beginning of our long drive and about how we’d clean it up. I’d packed a spare towel and cleaning stuff just in case but I knew if she went before we left, she’d probably be ok until the evening. First hurdle passed with flying colours, it was time to find out just how effective Millie’s cat carrier had been. She excitedly dashed inside the Sleepypod as soon as I put the treats in. Before she could fully understand what was about to happen she was strapped to the back car seat and it was only then did she start to meow. I sat in the back next to Millie. Our bedding, including blankets on which she slept, were spread over the seats so it all looked and smelt familiar to her. Her cat bed was next to the carrier and we’d even put our dressing gowns out to help her feel she was in our bedroom, and therefore in a safe environment. She meowed for the first five to ten minutes of the journey but soon enough her meows became less frequent. Perhaps it was a combination of the Gabapentin pills kicking in and feeling pretty chilled in the Sleepypod, but you wouldn’t have even known there was a cat travelling with us. I even opened the carrier once it was safe to do so and she just lay there, slowing blinking back at me in her usual regal manner, seemingly quite content. An hour and a half later, we arrived at the Eurotunnel and pulled into the FlexiPlus area for a bathroom break and to grab some free snacks (we’d paid extra for this after all!). 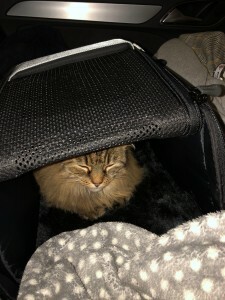 One bit of advice from my research was that we should never Millie alone in the car, not that we would’ve wanted to of course, so we picked up her carrier and took her inside the terminal building with us. She was as good as gold and didn’t make any noise. Maybe she was frightened or perhaps she just trusted us, who knows? Then it was time to board the Eurotunnel train. As we pulled into the carriage and drove upstairs to the higher level, Millie became a bit more startled by all the new sounds. There was also a scary, strange man in fluorescent orange standing by the car giving Ed a few important health and safety tips. Within 10 minutes we were on the move and the slow hum of the moving train actually lulled her to sleep. Before we knew it we were out the other side and Millie was now officially a border crossing, international, globe-trotting feline. Welcome to France Millie Miller! Driving through France was fairly straightforward and Millie was settling into life on the road like a pro. She was pretty happy and relaxed in her Sleepypod along the endless French motorways. The only time she got flustered was when we stopped at the tolls, which was always quite an ordeal. Driving a British car meant poor Ed was on the wrong side for the toll booth. He had to unbuckle his seat belt, lean right the way across the passenger seat and put the window all the way down and hang out of it to collect the ticket or chuck coins into the toll machine. Even being 6ft 5 didn’t help his cause. But once we were through the barrier Millie relaxed again and even drifted off to sleep every now and again. Tip: Another thing I’d read during my research was the amount of cats that go missing at toll booths and petrol stations when car windows and doors are open. So only open doors or windows when your cat is safely in their carrier! As we approached Bordeaux – our first stop – it became very clear I should’ve spent a bit more time researching our hotel choice. We were heading straight to the city centre in rush hour traffic. Plus our hotel turned out to be in a very narrow, one-way street, with nowhere to pull over outside let alone park. Massive, MASSIVE error on my part! Tip: Avoid city centres and find a hotel with onsite parking. The hotel information online claimed there was parking, but failed to mention it was down the road in a public NCP car park. So do make sure you double-check. It wasn’t ideal. Not only did we have our own luggage to haul inside, we also had Millie’s overnight bag and she had a lot more stuff than us, including her bed, litter tray, food, and her bowls. I took Millie straight up to our room to get her settled as quickly as possible, leaving Ed to make several trips bringing everything in. Tip: Do a sweep of your hotel room before letting your cat out of the carrier. Check all windows are closed and look for any potential hiding spots. I noticed Millie would be able to get under the bed pretty easily and there was nothing to barricade it with. I shut the bathroom door, put the carrier on the bed and slowly opened it. Millie’s dark eyes met mine, wide open, pupils dilated. She was clearly really freaked out and the pills had worn off. She stayed put for five to 10 minutes, scanning the room. She only made her way slowly out of the Sleepypod when I put a bowl of wet food out on the bed nearby for her to eat. It was now 6:30pm and she hadn’t eaten for over 12hours – a first for Millie who tends to eat little but often. Ed was still ferrying her overnight bags and before he got back from his last excursion Millie got spooked by the sound of another hotel guest. She fled under the bed and there she stayed for most of the evening. I got a bit upset because it really brought home how scared and unsafe she must have felt, and I felt guilty for putting her through this. Ed ordered a takeaway pizza and we sat in bed eating like we were students again while Millie sulked underneath. As we started to settle down to sleep she emerged and started mapping the room. Discovering it was safe, and she was satisfied with the standard (!) she hopped up and into her bed, which we’d laid out along with her blanket for familiarity. I felt a huge sense of relief and hope that maybe, just maybe, we would get through this journey unscathed. I woke up quite suddenly the next morning. It was pitch black, which I’m not used to as our curtains at home are quite thin and I always wake up as soon the sun rises. When I remembered where we were my first thought was Millie. My eyes darted to her little bed. It was empty. I sat up and looked around the room. No sign of her. I checked the window. It was still shut – phew! To my relief she was hiding under the bed again, her wide eyes met mine with fear as I tried to coax her out. In the corridor outside I could hear trollies bashing against the walls, as cleaners went in and out of each room. The sound had frightened her. I got another pang of guilt and sadness because I really don’t like seeing an animal distressed – especially Millie. She’d eaten her food and drunk her milk though which was a good sign. She stayed under the bed for another hour or so while Ed & I got ready, coming out eventually for her breakfast. I’d slipped in another two Gabapentin pills to chill her out on day two of our mega road trip. I was feeling a bit anxious about getting her back in the Sleepypod but luckily putting a treat inside worked. Thank goodness I’d spent time getting her used to it. Back on the road again, she settled down quickly and began to relax while we sped towards Spain. Whenever the roads were straight and empty I opened the carrier so Millie could peek out if she wanted. A few times during the journey she even ventured out to curl up and sleep on my lap in her bed. I know it’s not too good an idea to let a cat out in the car but I could tell all she wanted was a cuddle and to sleep. At the first sign of her wanting to explore or visit Ed in the front, I would have put her straight back inside the carrier. Also, I had my arms around her and the cat bed – a bit like a human seatbelt. It’s still not something I’d recommend unless the roads are super quiet and you’re sure there isn’t any danger. After a few hours Ed and I switched so I could take the wheel while he rested in the back with Millie. This was my favourite few hours of the entire trip as driving through Spain was stunning. The scenery was so calm and serene and the roads were pretty much empty. There was a real sense of peace in the car as Ed and Millie both slept in the back while I sang along to the radio. I was also lucky enough not to encounter a toll-booth during my time as pilot! The next few hours flew by and before we knew it we had crossed into Portugal: our fourth and final country. We were just a few hours away from our new home. By this point the sun was going down which meant Ed and I got to see a beautiful sunset, while Millie enjoyed more sleep. She carried on snoozing right up until we got much closer to our final destination and the amount of toll-booths increased. She seemed to sense our excitement when we approached the famous April 25th Bridge in Lisbon, as she suddenly became a lot more active. She sat on my lap while I held her close, and she craned her neck as she looked out of the window at the bright lights overhead. Ten minutes later we were following a yellow tram through the city centre before turning into our road and pulling up outside our new home. After two full days on the road, 38hrs door-to-door, and 24hrs driving we had finally made it. Thinking back to our arrival on that chilly December night, the following few hours were a bit of a blur, probably due to a mix of exhaustion and relief! After we’d parked up outside our apartment, I got all Millie’s stuff out of the car and putt everything in one room. 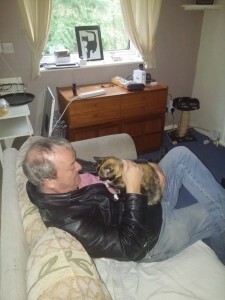 I then brought her in and showed her around her new home. That first night we all slept on a mattress on the floor and I remember Millie looking pretty content as she groomed herself in her bed just before we all fell asleep. Bit by bit she started exploring other rooms, mapping and scenting things as she got used to her new surroundings. The biggest issue has been going from a lovely quiet three-bedroom semi detached house to a ground floor property in a city centre apartment block, with a lot of new noises for her to get used to. We’ve also had the added joy of building works next door, plus she wasn’t particularly happy when the removal men turned up with all our furniture from London. However, while they were here, she found a safe spot in our wardrobe and hid in there until they left. A few weeks on though, Millie seems a lot more at home and is back to her old self. She still gets a bit spooked by neighbours coming in and out of the building entrance, which is right by our front door, but she’s slowly becoming more familiar with the noises. I’m really surprised how well our move to Lisbon went. As with most things you dread, it wasn’t quite as horrific as I’d imagined. Huge thanks to my incredible husband Ed, whose patience and understanding has been second to none during this entire process. And of course, thanks to Millie who was the prefect travelling companion. The experience has made me realise just how amazing cats are. They really do adapt to whatever their nine lives throw at them. This entry was posted in Uncategorized on April 23, 2019 by MrMonty2014. Say hello to Richard Williams – the newest member of Team Monty! Richard will be helping The Staff during busy times and naturally he has my seal of approval. 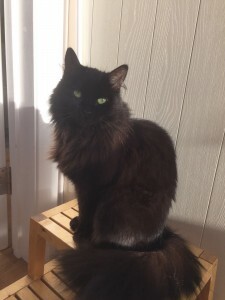 The Staff – Graham and Elaine – worked with him in one of their previous nine lives and he always used to cheer them up with his wicked sense of humour. Kind, caring and 100% reliable he was an obvious choice when they were looking for someone to join our team. Of course he had to pass The Monty test first. So I sniffed him out and decided he’s up to my standards. Richard is cat uncle to James, Maurice, and Phoebe, and Ella, and moves into their home to look after them when his sister and her family are away. He also looks after friends’ cats too. Unfortunately, he has a D.O.G. She’s called Doris and I’ve decided to tolerate this foible because of his more positive traits. In his spare time Richard treads the boards at the CornerHOUSE theatre in Surbiton. The Staff told me that means he’s a ‘thespian’. Whatever that is I don’t much care because he seems purrrrfectly nice to me. He has a Level 3 certificate in British Sign Language and is currently studying for an MA in Drama Therapy at Roehampton University, which I think makes him an all-round good egg! This entry was posted in Uncategorized on July 25, 2016 by MrMonty2014. This is Piers. 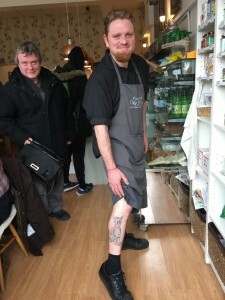 He works in the Pickled Pantry café in Surbiton where The Staff seem to spend most of their time (and my profits) when they’re not tending to my clients. 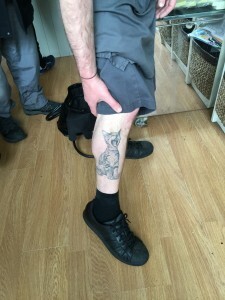 Piers, who is from California, has a rather fabulous feline tattoo on one of his legs. But it’s much more than a great drawing – a lot of thought went into it and it has lots of meaning for him. 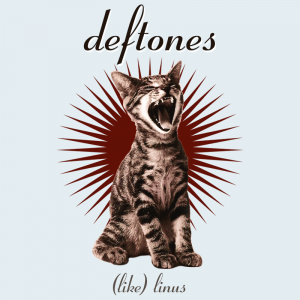 First off the tattoo is a copy of an illustration from a 1993 album by the Deftones called ‘(Like) Linus’. 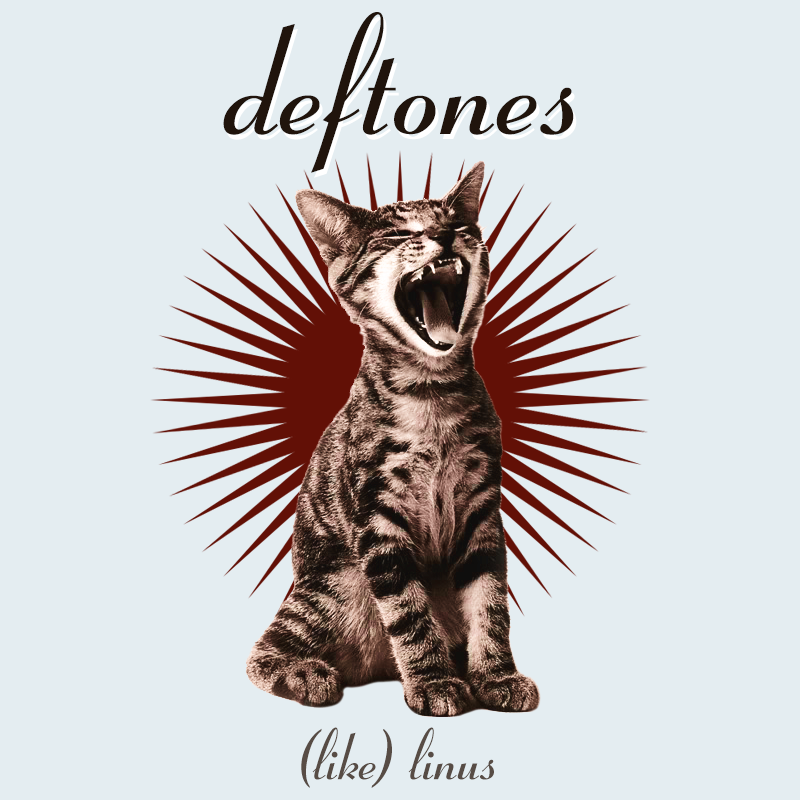 The Deftones are Piers’s favourite band and listening to their music inspired him to take up the bass guitar. The kitten is yawning which reminds Piers that every day is a new day – a philosophy I definitely subscribe to! Next up the drawing reminds him of his brother who he was reunited with after many years apart. Isn’t that lovely? My brother lives two doors away and I can see him anytime I like. It must have been so sad for them both not to be in touch, but wonderful when they met again for the first time. 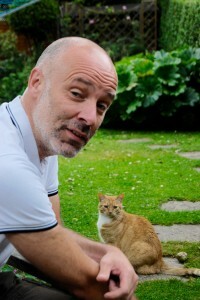 And finally, Piers has a cat back in California, called Muse after the band. 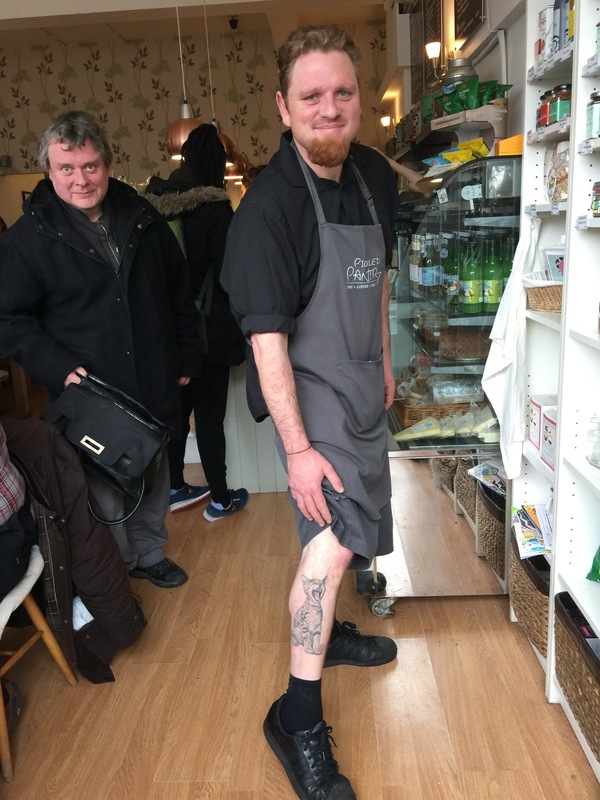 The Staff would like to say a huge thank you to Piers for always giving them a warm welcome, for his permanently beaming smile, and for always remembering how they like their coffee! This entry was posted in Uncategorized on May 11, 2016 by MrMonty2014. Although we only service an area within a mile of where we live, getting between my clients can be a bit challenging for The Staff at times. 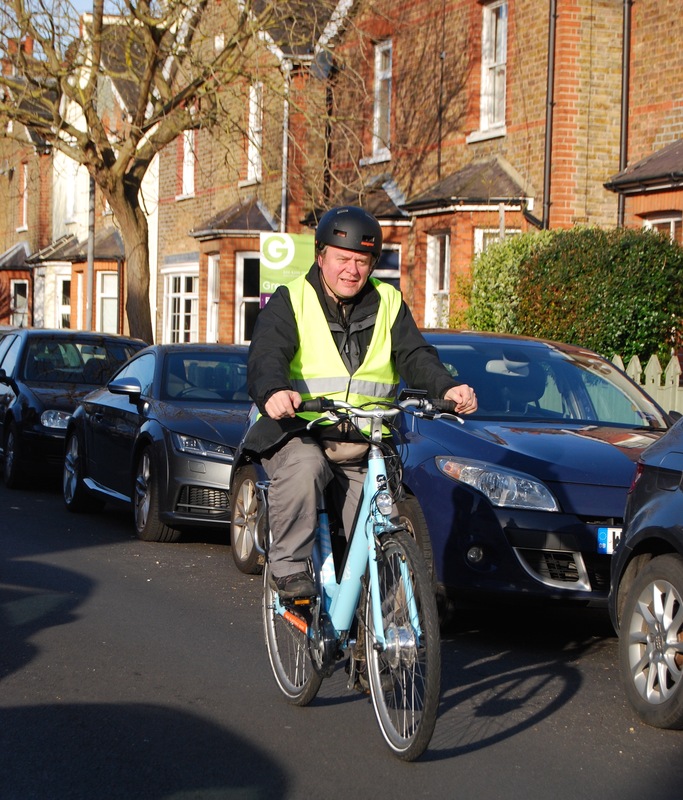 Graham sometimes cycles but he’s no Bradley Wiggins and he’s always moaning about the steepness of some of Surbiton’s hills. 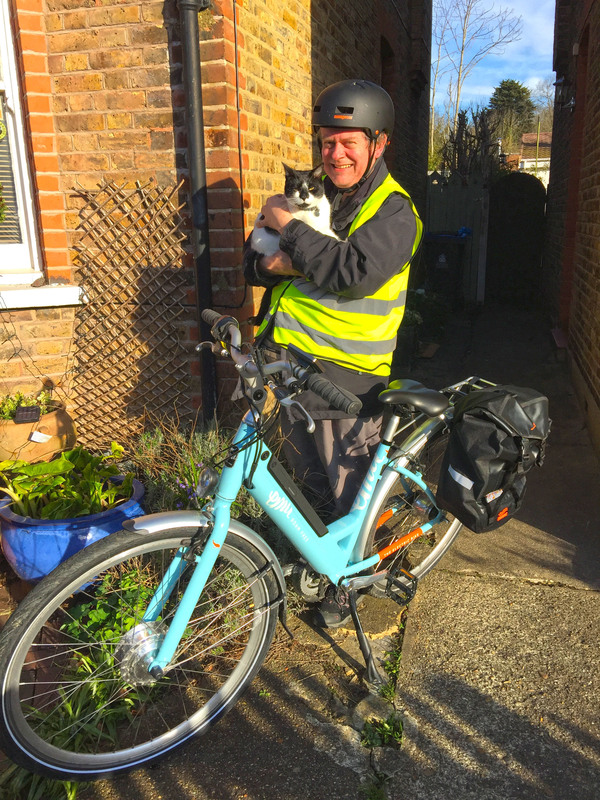 So he was delighted when Tim Hunnable of Emu Bikes asked if he’d like to try out one of their whizzy electric bikes for a week. 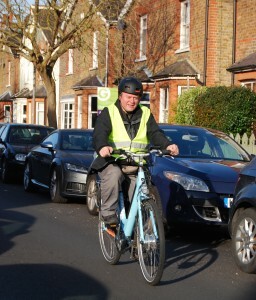 If you heard an electric whirring noise accompanied by loud “yippppeeeeees” in Surbiton recently, you might well have witnessed Graham zipping up those hills! This entry was posted in Uncategorized on April 11, 2016 by MrMonty2014. “The naming of cats is a difficult matter. It isn’t just one of your holiday games’. So wrote the famous poet T.S Elliott in my favourite book – ‘Old Possum’s Book of Practical Cats’. And so it is. But did you know we cats have special names for our human friends too? So The Staff were delighted when one of our long-term clients, and great feline friend, Scout, came up with names for each of them. He decided on Graham’s a few months back and named him ‘Mia Mia Mow’ in cat-speak. Elaine has only just been bestowed with hers and is feeling very proud to be called Purrow Prow! This entry was posted in Uncategorized on February 28, 2016 by MrMonty2014. After two years and 2000 plus visits, The Staff are used to finding dead offerings at clients’ houses but a recent experience still has them chuckling. I wish they’d get over it – it’s beginning to get annoying – but I thought I’d share it with you nonetheless. 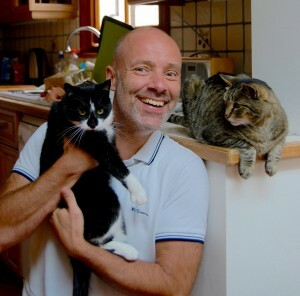 The story begins with two lovely regular clients – Smokey and Cookie. Cookie is very shy and is usually hiding under the bed. Smokey, on the other hand, is very friendly… to humans. To the local mouse population she’s The Terminator in a furry coat. On the first day she was lying with her head under the sofa and no amount of coaxing would bring her out. Sure enough, on the second morning, The Staff found a little mouse corpse. That evening, Smokey and Cookie’s usual servant, Clare, messaged to let The Staff know that her brother-in-law, Clayton, and his son, Thomas, would be arriving that night to stay for a couple of days. Next morning, the visitors were still in bed when The Staff arrived. And there on the kitchen floor was another dispatched mouse. They cooed over it sadly for a few minutes, because they’re soppy like that, before disposing of it. They’d set off to go into London again for the day, starting with a 20 minute walk to the station, followed by a 30 minute train journey (there is a point to all this detail – honest!). They walked around Covent Garden and Leicester Square, then ended up in a restaurant in Piccadilly. Clayton took off his coat and was about to sit down, when the waitress, her eyes wide in horror, said, “Um, excuse me sir, but do you know there’s a mouse sitting on your shoulder?” Sure enough, as he glanced to his left, he found himself staring into the eyes of a small rodent. What an adventure for the little fellow! (the mouse, not Clayton). Not only does he escape Smokey’s usually fatal clutches, he goes on a train journey and a sightseeing trip to London. I wonder if he’ll find his way home to Surbiton? This entry was posted in Uncategorized on February 24, 2016 by MrMonty2014. I have some rather lovely news about one of my clients, Narla. Some of you might remember that earlier in the year I used Facebook and Twitter to ask if anyone could help to find her a forever home. 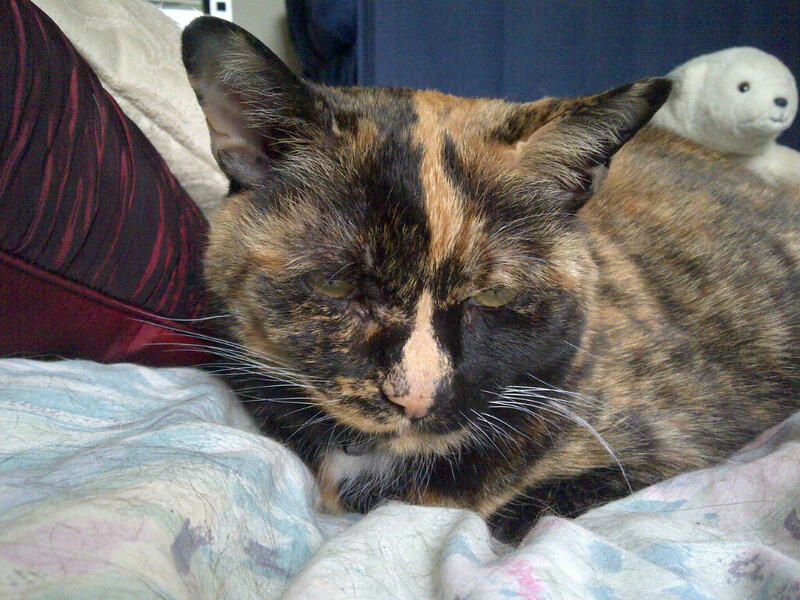 Narla was up for adoption through the Houslow Animal Welfare Society (HAWS) and was being fostered by a lovely lady called Melanie in Surbiton. Melanie had booked The Staff to fuss and feed Narla several times and we were determined to help find her a permanent home. 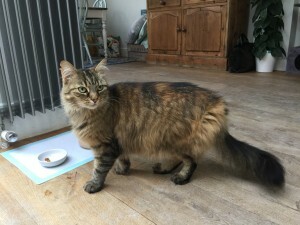 I tasked The Staff with talking about her at every opportunity but it seemed that no-one wanted to take on a 10 year puss – no matter how loving and gentle she might be. Then along came Robin! He’d tried to contact me months ago but dopey Elaine hadn’t found his message (seriously, I sometimes wonder why I just don’t do everything myself). Robin contacted HAWS anyway to find out more. At the time he had an elderly cat, Topaz who had lost her twin sister and thought Narla would be company for her. However he and the charity decided it wasn’t fair on either Topes or Narla. Then two things happened. Sadly Topaz passed away and Elaine finally found Robin’s message and got in touch with him. (I made her apologise profusely). Although he felt he could never go through the pain of losing another cat, he was please to hear Narla was still available for adoption. He got in touch with HAWS again and went round to meet her. She stole his heart there and then. “I sat beside her, stroking her and she purred her heart out. How could I resist?” He signed the adoption papers and arranged to pick her up the following week when he could take a few days off work to keep her company as she settled into her new home. “We’re a perfect match,” he laughs. “Getting on a bit, tubby and a little bit lazy – e-Harmony would love it! 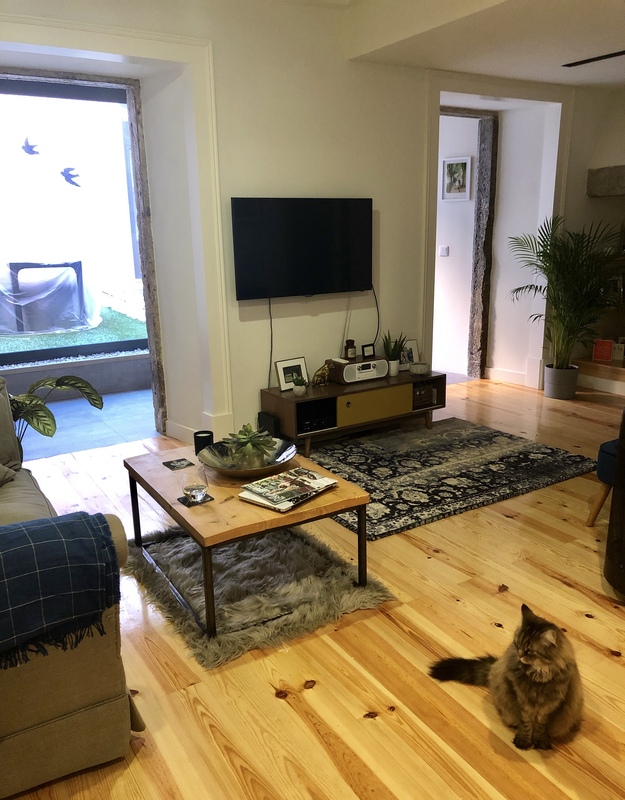 “I live in a town house which has three floors, so Narla spent the first few days exploring, making herself at home and finding her paws. She’s already found a few places that she now owns. 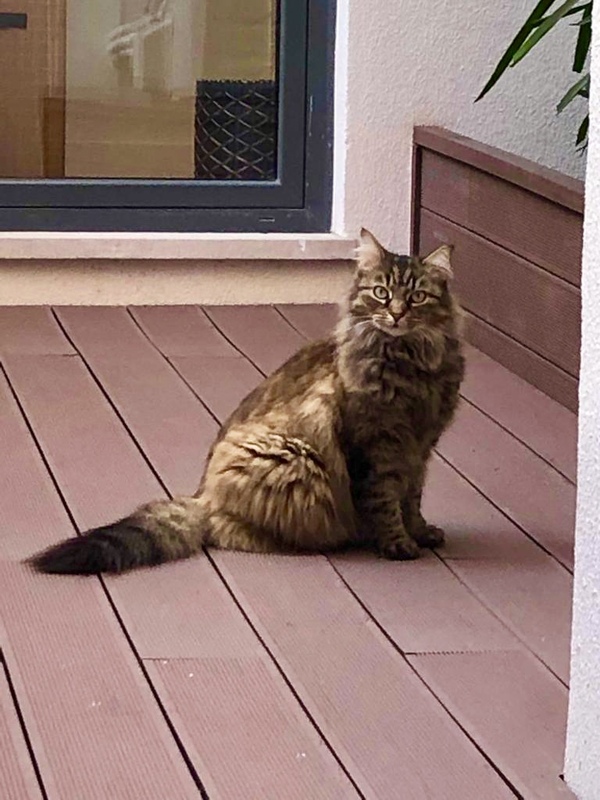 I think she’s gorgeous!”Huge thanks to Robin for giving Narla a permanent home and to Melanie for looking after her so well for the last 18 months.I hope you’ll be really happy together Robin! This entry was posted in Cat health, Uncategorized on November 28, 2015 by MrMonty2014. 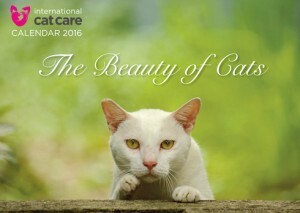 International Cat Care’s calendar – the purrrrrfect Christmas gift! This time of year does seem to be particularly stressful for you humans for some reason. And present buying so let me make it a little easier. How about the stunning International Cat Care calendar? Featuring 12 beautiful feline portraits it’s the purrrrfect gift for all the cat lovers in your life. The calendar costs just £9.50 plus packing and postage, and all proceeds will help to fund International Cat Care’s (iCatCare) wonderful feline welfare work world-wide. 1) International Cat Care is a charity whose mission is “to engage, educate and empower people throughout the world to improve the health and welfare of cats by sharing advice, training and passion”. 2) Their website is full of the most comprehensive, up-to-date, thoroughly researched information and advice. 3) The charity champions humane, non-surgical population control for street cats. They want a world where no more kittens are born to die on the streets. 4) The International Society of Feline Medicine (ISFM) is the charity’s veterinary wing – set up to help make sure vets have a better understanding of their feline patients’ needs. 5) International Cat Care’s Cat Friendly Vet Practice accreditation scheme aims to make visiting the vet a happier experience for cats. 6) They are working with insurance company Agria, and the Veterinary Poisons Information Service, on a new campaign – Keeping Cats Safe. 7) They run training events, conferences and webinars for vets, vet nurses, other cat professionals and owners, and international welfare experts. 8) iCatCare produces useful videos on things like giving a pill to trapping a feral – you can find them on YouTube. 9) They produce informative guides on looking after your cat and keeping them safe – keep an eye on the website for a new guide on caring for your kitten. 10) They do lots of valuable research including looking at how cats react to new babies. They’ve used the research to develop a guide for introducing your cat to the new arrival. 11) iCatCare’s team includes Dr Andy Sparkes, one of the country’s leading feline vets and Dr Sarah Ellis, the cat behaviourist from the BBC Cat Watch series. 12) International Cat Care works for all cats – owned and unowned. Their vision is for a world where cats are treated with understanding and compassion. So there you go. Your cat loving family or friends get a beautiful calendar and you help this wonderful charity – what’s not to like? This entry was posted in feline inspired artworks, Uncategorized on November 15, 2015 by MrMonty2014. The Staff have just had a very disturbing call from one of our Fuss and Feed clients. She’s seen someone trying to coax her cat into a basket on three occasions now – in broad daylight. This morning she was able to go out and confront him. He ran off. He’s black and around 5’ 8” and has a cat basket with him. 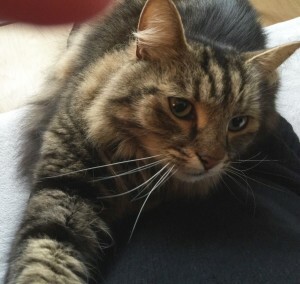 Our clients live in Berrylands, Surbiton so if you are in the area, and have feline friends, please, please be extra vigilant. Please tell any of your friends who share their homes with cats too. 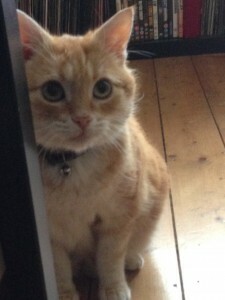 The Staff and I would be very grateful if you could spread the word and look out for this guy if you live in Surbiton. This entry was posted in Cat health, Missing cats on November 12, 2015 by MrMonty2014. Cafrey is one of our lovely clients. He’s a beautiful elderly ginger gentleman with the loudest ever purrrr. He’s been with his regular staff, Adam and Lucy, for exactly one year now. Adam and Lucy have a very successful blog called LDN Life, which they set up in 2013 to blog about life in London as they see it – particularly about food in the capital! They have a team of London loving bloggers who write news, reviews and interviews for LDN Life. The blog was Highly Commended at the UK Blog Awards for Food and Drink and has been shortlisted for the 2015 awards – so best of luck, I have all four paws crossed. Adam very kindly gave my Fuss and Feed service a mention in his latest post which is all about Cafrey – huge thank you from me and The Staff. This entry was posted in Uncategorized on March 30, 2015 by MrMonty2014.